French painter Véronique Brosset attempts to capture the uninhibited liberation and unchecked imagination of childhood memory and emotion. 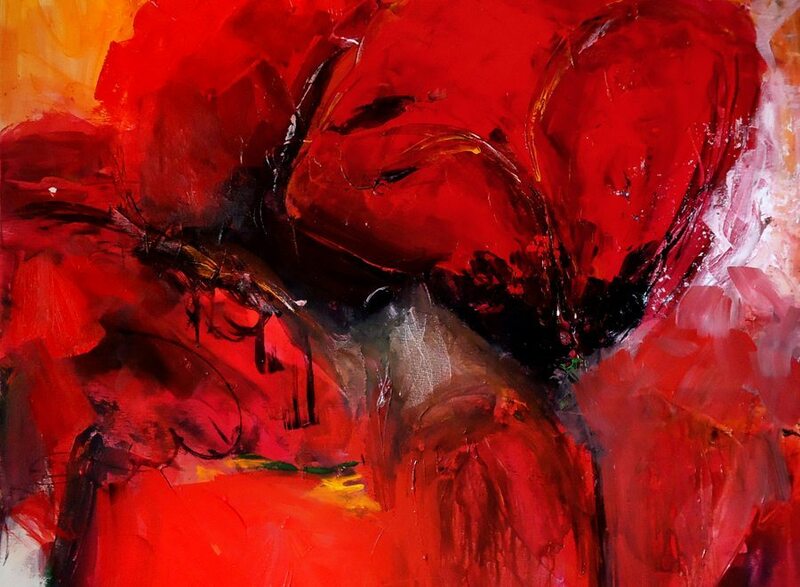 The sweeping brushstrokes and dramatic color combinations that comprise her abstract, expressionist artistic method lend her paintings an intense presence and forcefulness that compel viewers to feel the emotions of her works at an instinctual, visceral level. Her works have no formula and are rarely premeditated – with each of her brushstrokes, Brosset attempts to capture the unadulterated emotion that she finds in her subconscious and her childhood memories. Brosset is not concerned with what she calls the “wise or brooded or reasonable” and instead seeks to return to “carefreeness” by way of the “sheens of past which are pure and intact” in her memory. This painting, titled Imprud’anse, highlights her heavily abstract artistic method. The deep red that dominates the painting is characteristic of her works – the seemingly uncontrolled energy with which Brosset applies the red to her canvases, along with the more general physicality of her brushstrokes, adds a striking element of violence to her works. Yet the red in this particular work is softened by the other colors in the painting. It is warmed by the surrounding oranges and deepened by the streaks of black that are blended into the brighter colors. The gradual darkening towards the center of the work and the rounded red shapes make the painting vaguely reminiscent of a poppy flower – scarlet petals surrounding an unexpectedly black eye. Poppies have come to symbolize death and remembrance. It is thus hard to define the emotion of the work: the painting exists somewhere between devastating violence and passionate warmth, drawing the viewer in while simultaneously making them fear what they might find within their own subconscious. The painting exists somewhere between devastating violence and passionate warmth, drawing the viewer in while simultaneously making them fear what they might find within their own subconscious.